Recently, I find myself trawling through my Coron album. I sorely miss the place and figured it’s high time I blog about the trip. Initially, we didn’t have any booked flight yet from Manila to Busuanga. Probably the promo seats got sold so quickly. That fact didn’t hit me then last year, all I remember is one morning waking up to find my inbox with 5 forwarded itineraries to different destinations: Bangkok, Busuanga, Caticlan and Hanoi. That’s my friend Randolph for you. If before, he was considerate enough to ask before purchasing flight tickets, now he’s like that. No questions ask, you have to come to this trip. And look what happened to our supposed Indochina last month. LOL! We patiently waited for promos to come our way but to no avail. So about a month ago, Herbert finally asked me to book the departure tickets and the group decided we fly AirPhil for the first time. On the day of the flight, we had to harass Bong on the way to NAIA because the girl in the counter is threatening that it will close already to find out later at the gate while waiting that the flight will be delayed! BY 3 HOURS!!!! The thing is, all of us are thinking the same thing, this is our first time to try AirPhil express and we were all disappointed. 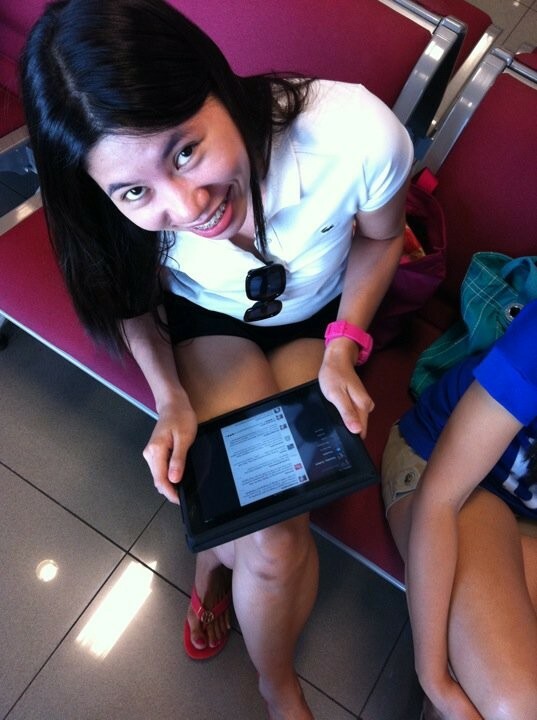 We thought of going out of the airport but luckily my friends have their gadgets to keep me entertained. Har har! Since the flight was moved from 10AM to 1PM, AirPhil was kind enough to give out free lunch. Jollibee. :P And then once inside the plane, we didn’t realize we had other friends at the back side. LOL! This is so common among foreigners noh? I remember I was surprised to find some guys also waving at the camera during the Crazy Galleon ride in Ocean Park earlier this year at HK (again, might do a quick post soon.) I mean it's fine really, as long as they don't harass me. Aaargh! On the van ride from the airport to our lodging, we travelled with a beautiful French family. Aah, I can’t stop staring at them - from the handsome daddy to the beautiful mom and their four adorable children in pairs (2 boys and 2 girls). They’re so lovely that we all looked their yayas, boys, drivers inside the van. Hahaha!! They alighted by the boat terminal because they’re staying at an expensive resort by the island. And then we traveled further to our lodging, at Coron Village Lodge. Surprisingly, they have wi-fi. =)) I dunno what I was expecting. LOL!